123.sogou.com is the PUP that uses misleading techniques to prevent removal. Use Reimage to locate malicious components and get rid of them faster than with uninstall instructions. A full system scan blocks virus reappearance and prevents traffic to malicious domains. How can 123.sogou.com infect my web browser? 123.sogou.com (a.k.a. Sogou) is a Chinese search site that has officially been listed as a browser hijacker and a potentially unwanted program. Although it is primarily targeting Chinese computer users, security experts have noticed that it becomes more and more aggressive because people from Europe and JAV have also started reporting about 123.sogou.com hijack. As soon as this hijacker drops a plug-in on all web browsers that the user has installed (Google Chrome, Mozilla Firefox, Internet Explorer, Safari, Opera, etc. ), you may find 123.sogou.com virus set as your default start page, search provider, and a new tab window. Such unauthorized browser’s modifications, first of all, are a clear sign that your PC’s system is vulnerable and can easily be affected by various cyber threats. Second of all, such modifications should not be tolerated. By settings this search by default, its developers seek to provide users with altered search results and, therefore, make them visit affiliate websites. That’s how affiliate marketing works. However, the biggest problem is related to the reliability of websites that 123.sogou.com redirects can expose you to. Since they are managed by third parties and filled with the content that is not checked, there is always a risk that after clicking on the links that this search provider presents you with you will be rerouted to suspicious or even malicious websites. Therefore, you are strongly recommended to remove 123.sogou.com hijacker by running a full system scan with Reimage or another reputable anti-spyware. Otherwise, it may start tracking your browsing activities, transmitting gathered information to its affiliates, slowing down the system and similar issues. 123.sogou.com is a misleading search site that is spread by ‘bundling’. It doesn’t have the official website, so even if it would look reliable and convenient search provider, you will not be able to install it by yourself. It always settles down on web browsers without an appropriate permission asked. That’s because it is spread bundled with legitimate applications and introduced as an ‘additional component’. Unfortunately, 123.sogou.com redirect virus is not presented such an explicit manner as we would like it to be. 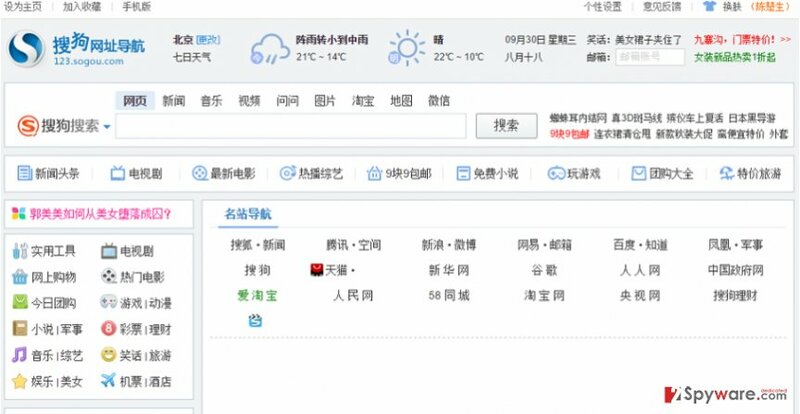 It may be hidden under Advanced/Custom settings, so if you usually do not check those settings, 123.sogou.com search may be set without your knowledge. In order to prevent this from happening, always select aforementioned settings and reject installation of additional components. Question: My web browser has already been infected with 123.sogou.com virus which is now bombarding me with suspicious ads and commonly making me visit unreliable websites. Is this search malicious and how should I get rid of it? Answer: 123.sogou.com is not dangerous. However, as you have indicated, it may display doubtful search results, generate advertisements and cause a whole range of inconveniences. Speaking about 123.sogou.com removal, it’s important to mention that it is usually spread bundled with other computer threats. Therefore, it might be that you computer is filled more than one potentially unwanted program right now. Therefore, we do not recommend initiating its removal manually. Our recommendation is to use a reliable anti-spyware that will automatically find and remove all potential and serious computer threats. Here, look for 123.sogou.com or any other recently installed suspicious programs. Wait until you see Applications folder and look for 123.sogou.com or any other suspicious programs on it. Now right click on every of such entries and select Move to Trash. When in the new window, check Delete personal settings and select Reset again to complete 123.sogou.com removal. Once these steps are finished, 123.sogou.com should be removed from your Microsoft Edge browser. Here, select 123.sogou.com and other questionable plugins. Click Remove to delete these entries. Now you will see Reset Firefox to its default state message with Reset Firefox button. Click this button for several times and complete 123.sogou.com removal. Here, select 123.sogou.com and other malicious plugins and select trash icon to delete these entries. Click Reset to confirm this action and complete 123.sogou.com removal. Here, select Extensions and look for 123.sogou.com or other suspicious entries. Click on the Uninstall button to get rid each of them. Here, look at the Homepage field. If it was altered by 123.sogou.com, remove unwanted link and enter the one that you want to use for your searches. Remember to include the "http://" before typing in the address of the page. Now you will see a detailed dialog window filled with reset options. All of those options are usually checked, but you can specify which of them you want to reset. Click the Reset button to complete 123.sogou.com removal process. 123.sogou.com vírus - ez micsoda? This entry was posted on 2015-09-30 at 00:35 and is filed under Stealing programs, Viruses. You can quickly scan the QR code with your mobile device and have 123.sogou.com virus manual removal instructions right in your pocket. How did you remove 123.sogou.com virus?